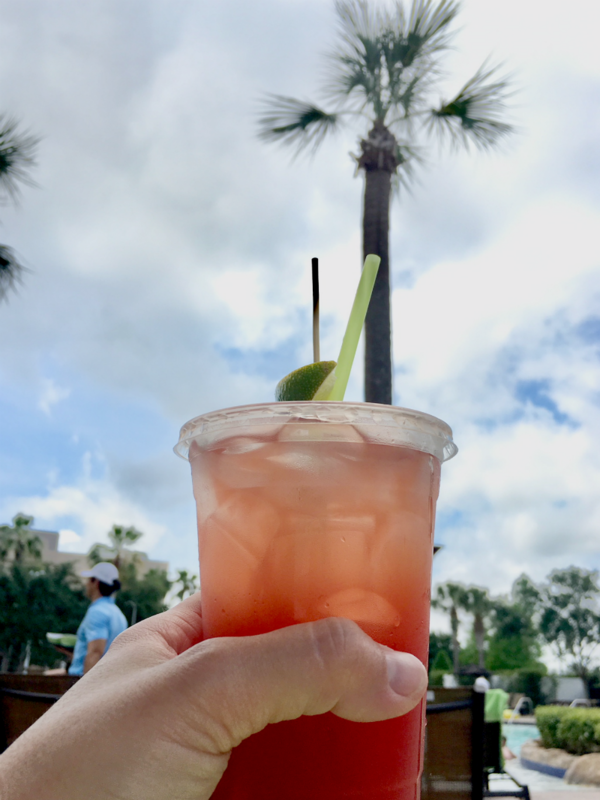 If you love to runDisney but are looking for hotel options (barely) outside the Disney bubble, you’ll want to learn about Marathon weekends at Hilton Orlando Bonnet Creek! Keep reading to see my 2018 review and loads of pics! And a major shout out to the awesome folks at Hilton Orlando Bonnet Creek for providing my accommodations. 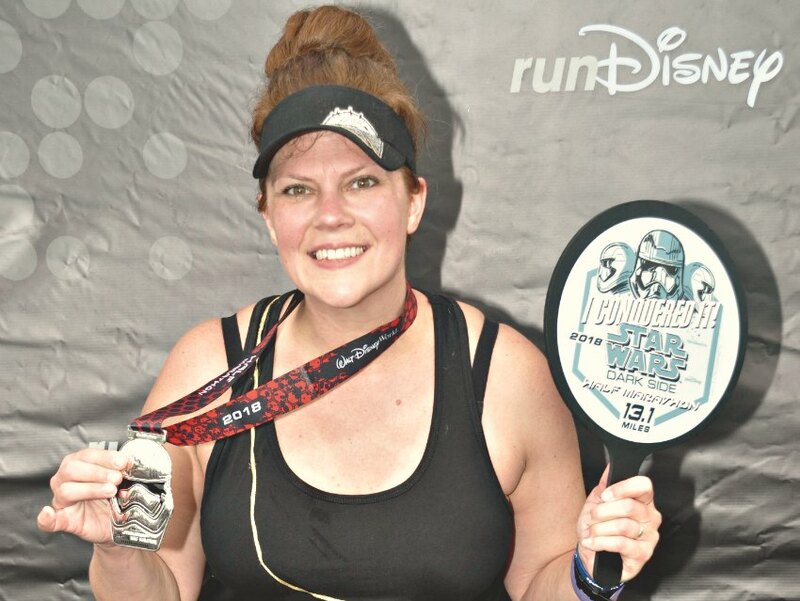 I hadn’t planned to participate in a runDisney race in 2018, but when things lined up for me to run the Star Wars Half Marathon, I couldn’t say no. I mean, who can resist a weekend at Walt Disney World Resort? Not this girl. Yes, it has been a while since my last half marathon, but it was worth it for me to give it a go. When I had the chance to experience this awesome race weekend program, I was sold. 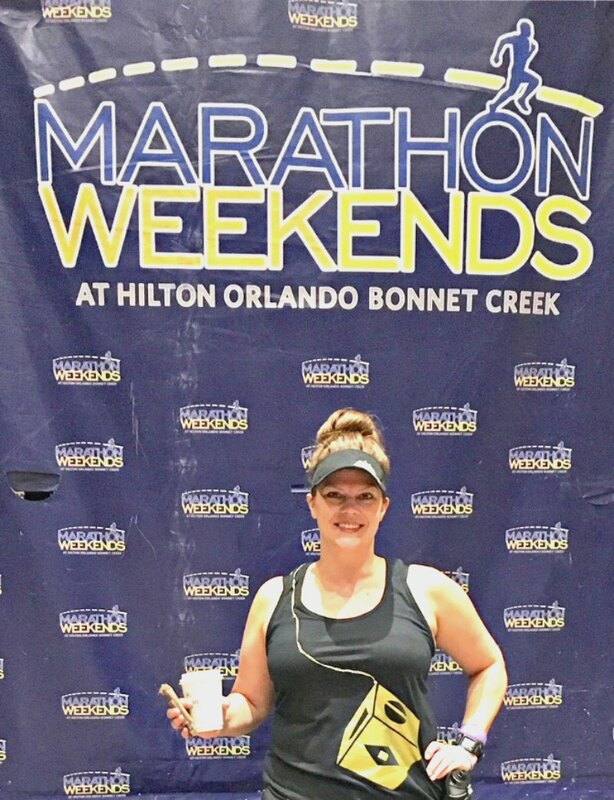 I’d heard great things about Marathon Weekends at Hilton Orlando Bonnet Creek and I couldn’t wait to check it out for myself. 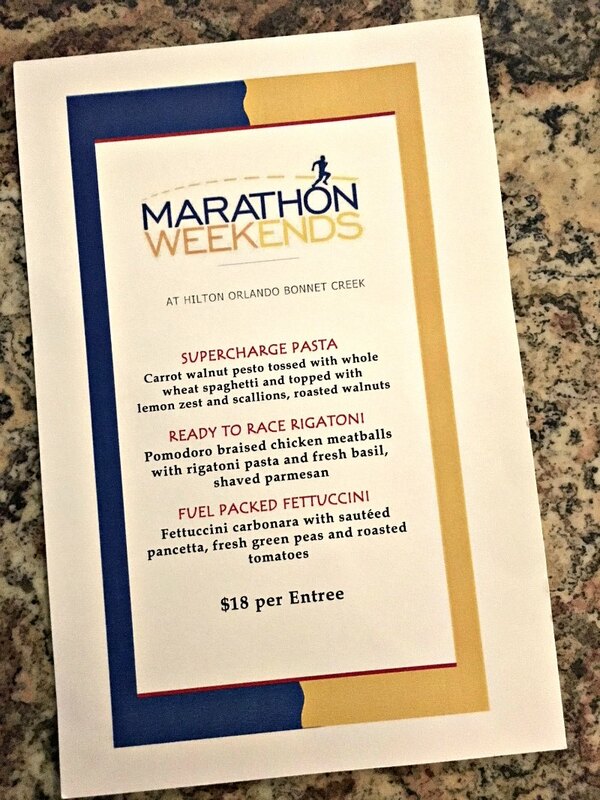 What are Marathon Weekends at Hilton Orlando Bonnet Creek? First of all, when I say “outside” the Disney bubble, I mean barely. Bonnet Creek is literally a stone’s throw from Disney property, they have a free shuttle to the parks and a fantastic pool. But before I get ahead of myself. 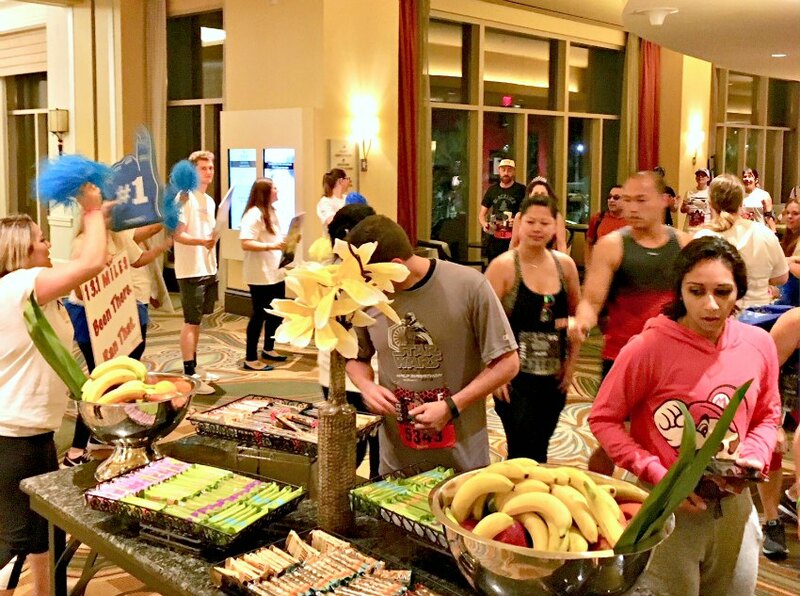 Here’s a little bit about what makes Marathon Weekends at Hilton Orlando Bonnet Creek stand out from other hotels. 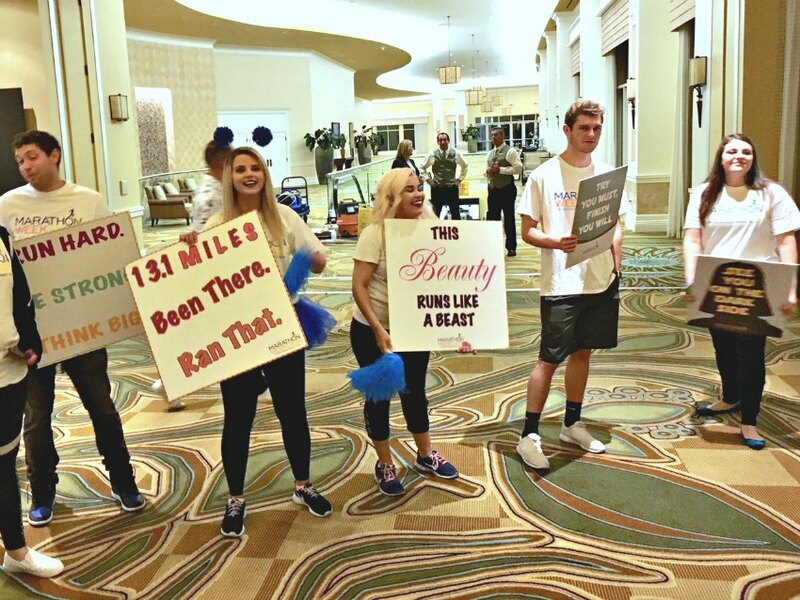 Encouragement & recognition from our Marathon cheerleaders…even at 3 am! My sister and I arrived early in the morning so we could enjoy Epcot the day before the race. Our room wasn’t yet ready so we dropped our bags and I checked in at the Marathon Weekends table in the lobby. Don’t skip this step because you’ll need a bracelet to take the complimentary shuttle on race day (for half and full marathon races only). We had an awesome day at Epcot and returned to this gorgeous room with an even more beautiful view. 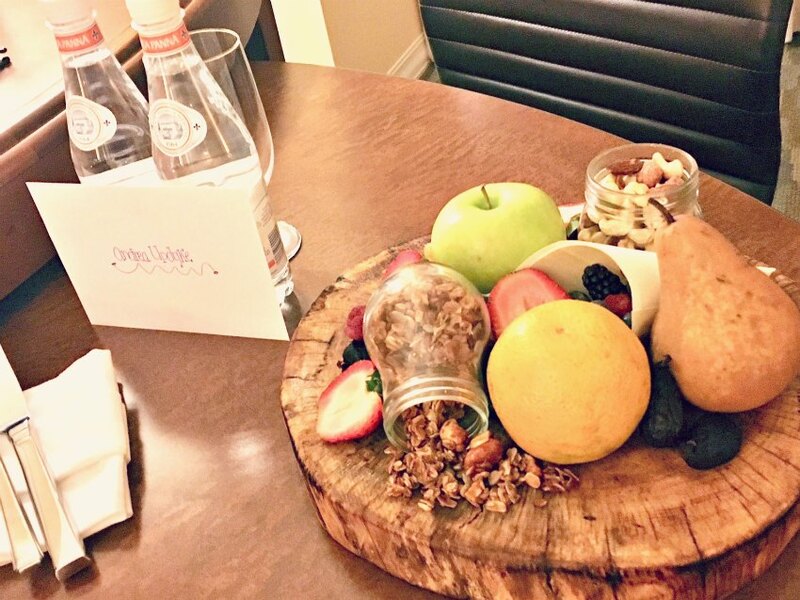 And I was so surprised at the lovely fruit tray that was gifted to me! Seriously, the staff here are so thoughtful and really took care of every detail. 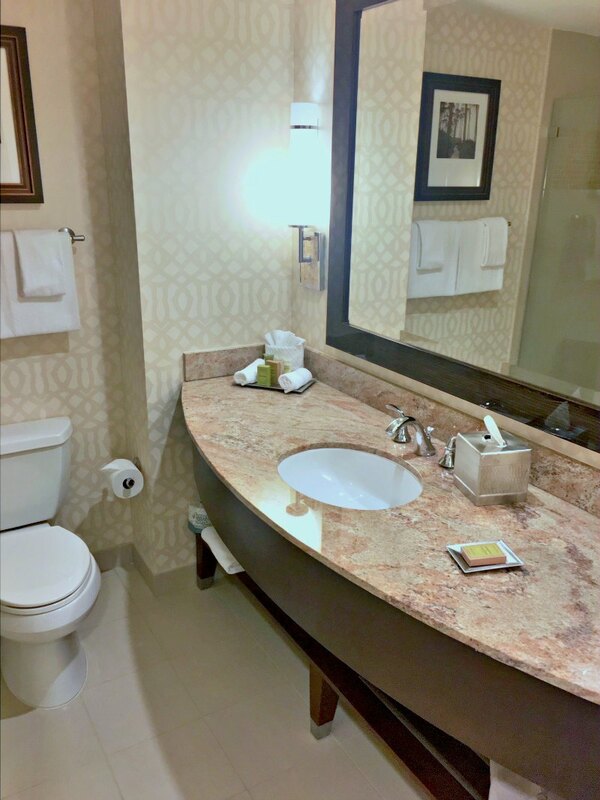 The bed was comfortable and roomy and I loved that there were plenty of mirrors in the bathroom and main room. Hotels with only one tiny mirror to share confuse me. I mean really. And if you don’t plan to bring your own toiletries, the Crabtree & Evelyn skin care line was a lovely touch. 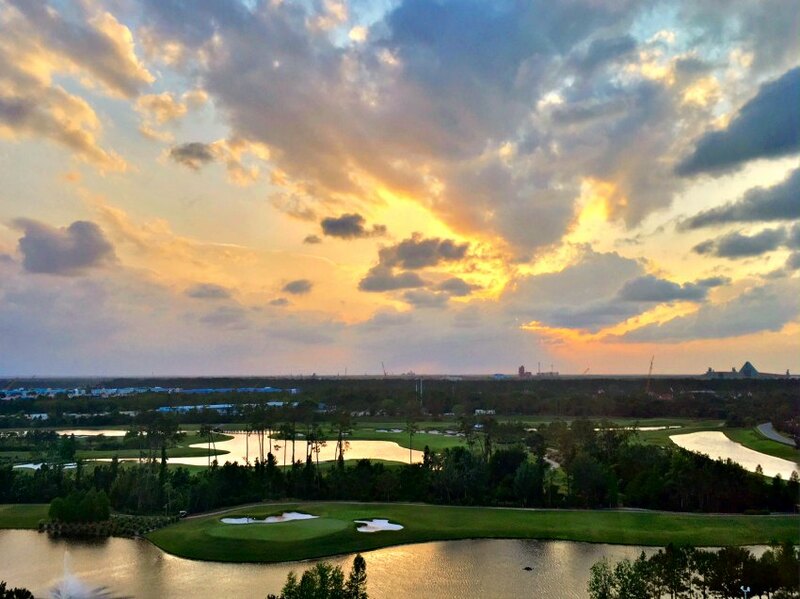 There are a rather stunning number of places to dine at Hilton Orlando Bonnet Creek. So many that we couldn’t try them all! That said, everything we had was completely delicious. The night before race day, we decided to check out Harvest Bistro. 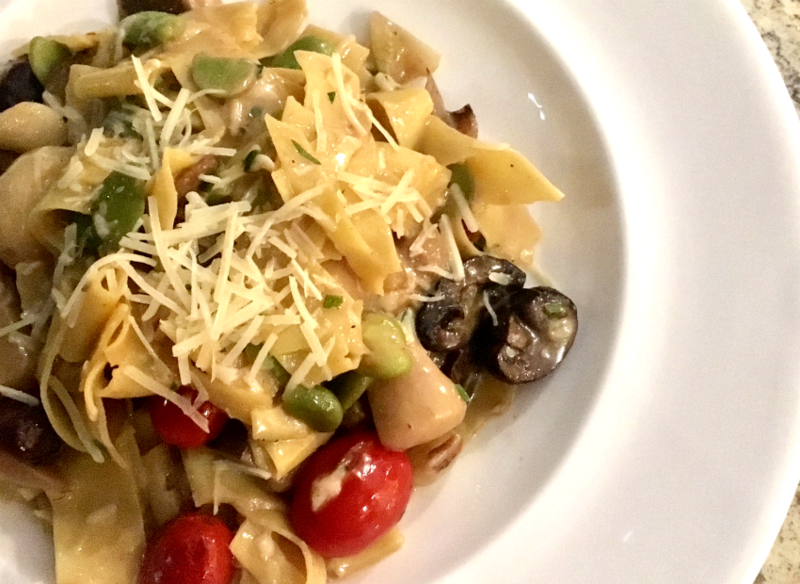 They offer a few carb-loaded pasta dishes along with a full menu. The special menu looked great but I ended up going with a pasta dish of the regular menu and it was amazing. 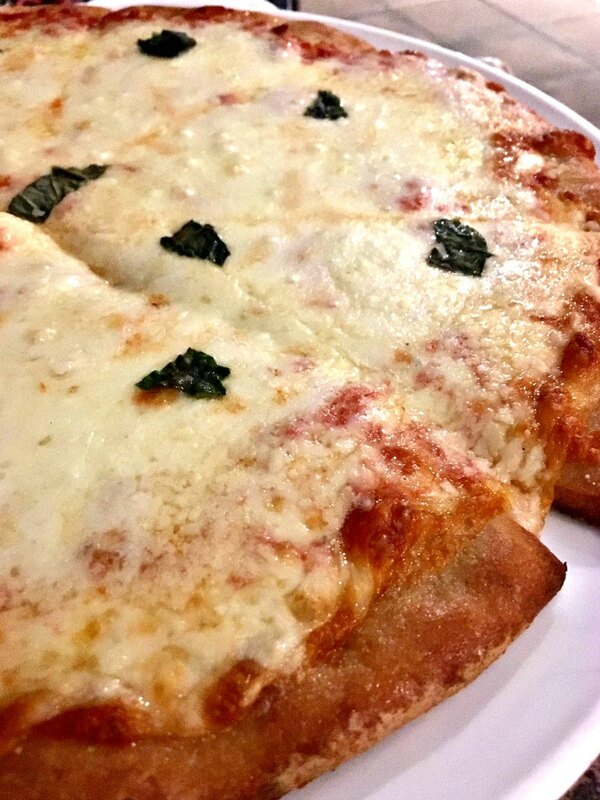 My sister went with pizza and loved it! It was such a lovely evening on the patio with a cool breeze. We could even hear the movie playing over the pool (The Incredibles). Earlier that day we grabbed sandwiches from Muse in the lobby because we were starving. These were pre-made and I’ll be honest, I wasn’t expecting them to be that good but I was really hungry. I was wrong! 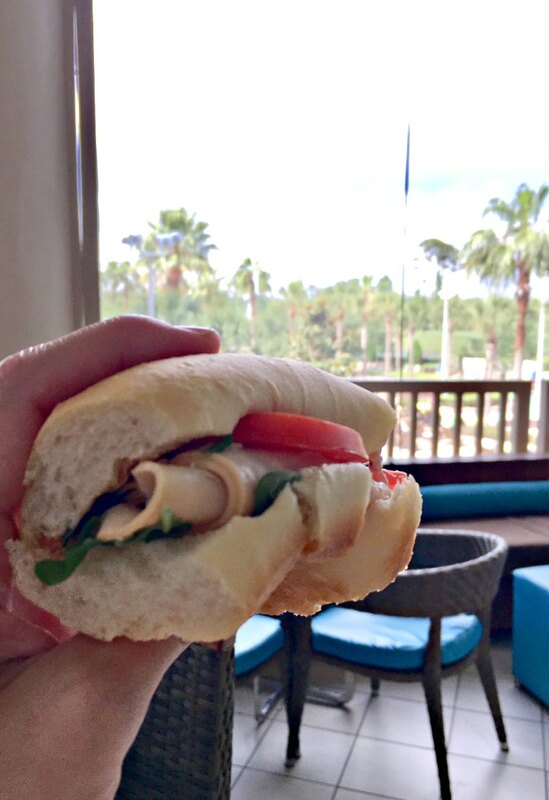 This turkey sandwich was incredible from start to finish. I could have eaten it every day! I would say one of the biggest perks of Marathon Weekends at Hilton Orlando Bonnet Creek is the sendoff party. I made my way down from my room into the lobby and suddenly heard cheers as I walked down the hall with other racers. The staff was there waiting with music and signs and a delicious buffet of pre-race foods like bananas, bagels, protein bars and plenty of water and coffee. It was such a nice way to start the morning before the race! 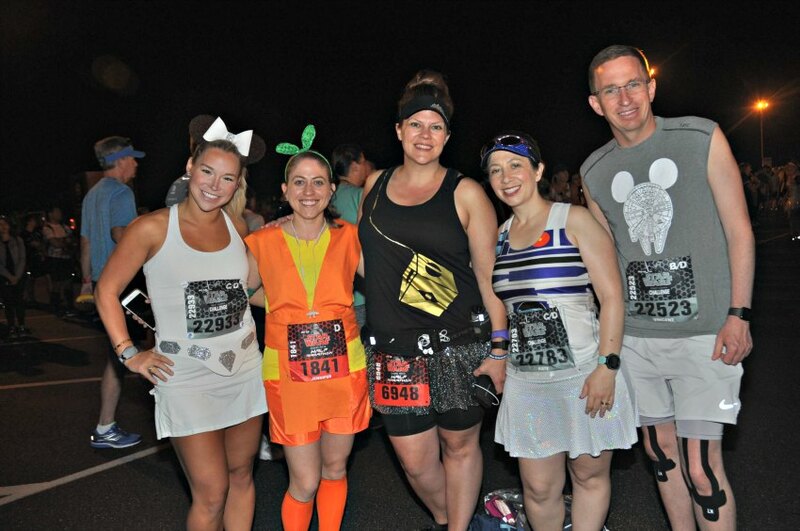 If you are unfamiliar with runDisney events, they typically start around 5am so racers need to allow around 2 hours to get to the starting line. It’s a process! After a quick photo with the race banner, it was onto the bus to make our way to the starting line. I only wish we could have been closer when the race was over! If you plan to use race transportation, be sure to allow time to walk (or in my case limp) back to the busses, which will be located in a designated area for non-Disney transportation. Once I was at the race and the crowds poured in, it was time to see friends! I loved catching up with a few of my fellow Disney Parks Moms Panelists! Even though I am inactive this year, it still feels special to be part of the team. Here I am with fellow panelists, Lindsey, Jen and Kate (and Kate’s hubby). Hi hubby! 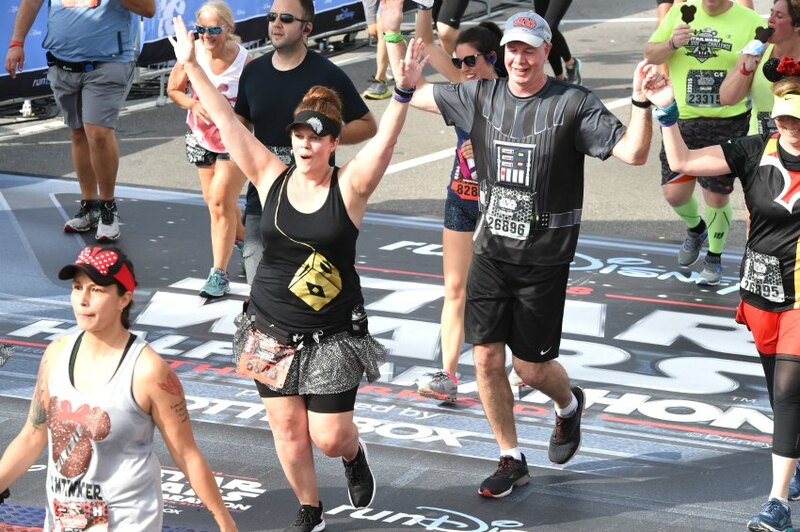 But y’all, I would not have made it through this 13.1 miles of Disney asphalt if it weren’t for my girl Amanda Tinney. When I say she was a godsend, I’m not exaggerating one bit. We talked, we ran, we walked, we encouraged each other. But most of all, we had SO. MUCH. FUN! If you ever get the chance to run with Amanda, say yes. You won’t regret it. I finished what I set out to do and while it was insanely hard (and probably just insane) I am so proud of myself! This was my 4th half marathon. I can’t believe it. Back at the hotel, I was ready for some serious pool time. Thankfully, the Hilton Orlando Bonnet Creek has a serious pool! Lounge chairs, hot tub, lazy river, drinks. Check check check check! My sister and I had lunch by the pool from Beech and I had the best margarita of my life! And that would be the Hibiscus Margarita if you’re taking notes. 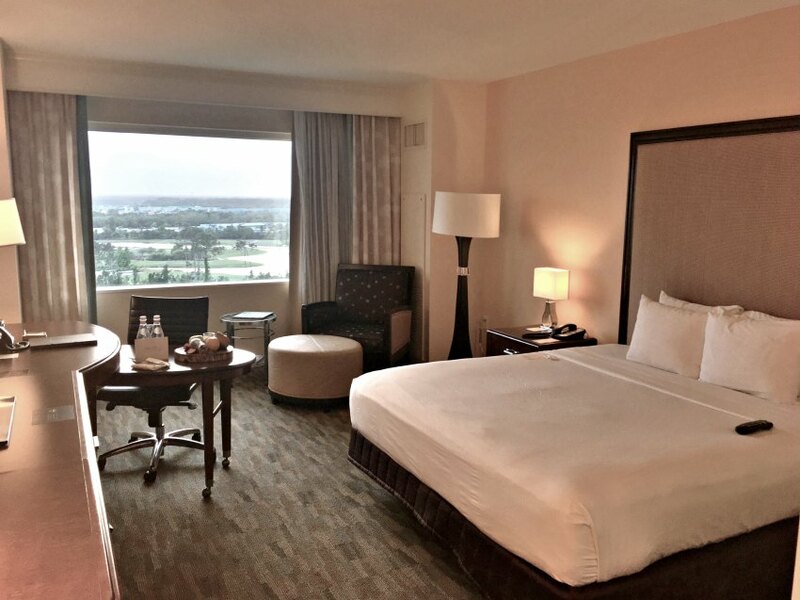 I’m definitely happy with my Marathon Weekends experience and beyond that, I think the Hilton Orlando Bonnet Creek is a really lovely place to be no matter why you are in Orlando. I love having options and I love sharing our experiences with you. 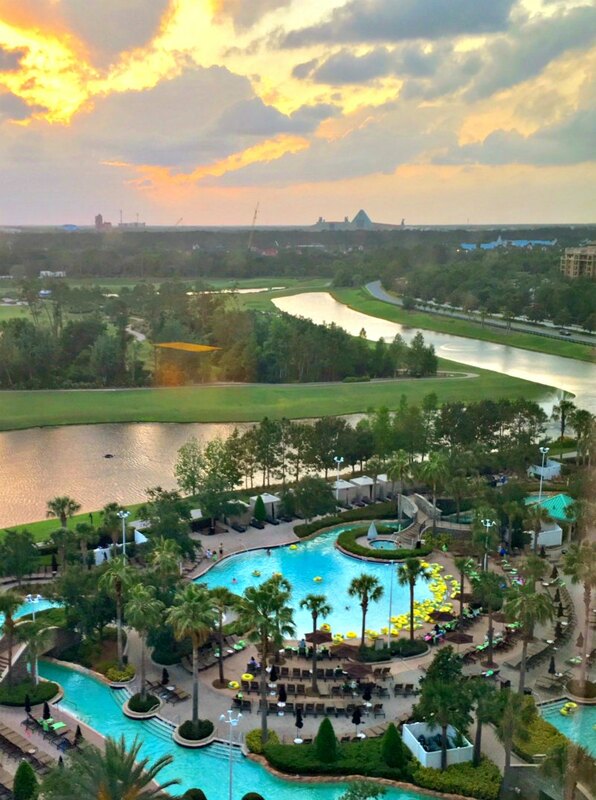 If you’re planning a trip to Orlando, keep this resort on your short list! And if you have any questions, please feel free to let me know. Wow they really go all out for runners! Love that they were supporting you guys with signs. And the custom marathon menu too! They do! I loved all the little details and having all that food and energy before the race helped a ton!